Mixing 200 singles with 1.5 tonnes of vegetables, 450 kilos of pastry and 750 kilos of fillings proved a recipe for success, producing 7000 meals to feed hungry and homeless people. The Feed Melbourne Cooking for a Cause singles night was an event that enabled participants to find love while making a big difference to the hungry and homeless of Melbourne. It was the largest scale Single Volunteers event to date and was held to help raise $1 million to feed, store and collect food for Victorians who are doing it tough. Feed Melbourne (www.feedmelbourne.org.au) is an initiative of Leader Community Newspapers, the food charity Fare Share and action group Do Something. Single Volunteers was created by Melina Schamroth, Founder and CEO of m.a.d.woman in a search for a new boyfriend (which proved successful). Schamroth joined forces with charity Fare Share 18 months ago to run Cooking for a Cause events for singles which are now held weekly. Schamroth said the positive feedback had been overwhelming. “People not only had an opportunity to find friendship or love, they all walked away knowing they had made an amazing difference to people who really needed help”. Participant Helen Kaptain said the event was a really fun way to meet other people while contributing to Feed Melbourne. Fellow participant Glenn McIvor said the event was fantastic. “It achieved spectacular results in feeding the needy and bringing a lot of like-minded people together in having fun”. Etihad Stadium generously donated use of the exclusive Medallion Club and the team from Delaware North Australia created a purpose-built kitchen. People who missed out on the event can still take part inCooking for a Cause at Fare Share in Melbourne. Tickets available on the Single Volunteers Events page. 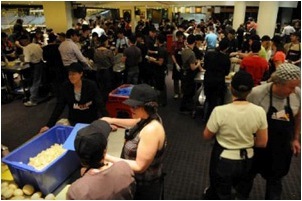 Check out photos from this Single Volunteers Cooking for a Cause at Feed Melbourne.